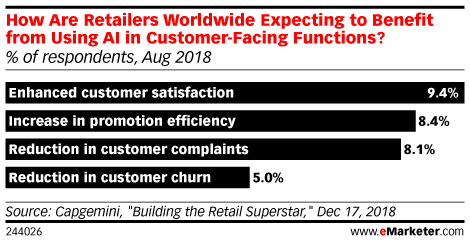 Data is from the December 2018 Capgemini report titled "Building the Retail Superstar." 400 retail executives in China, France, Germany, India, Italy, Netherlands, Spain, Sweden, the UK and the US were surveyed in August 2018. All respondents reported that they were implementing AI use cases at different stages of maturity across a range of retail subsectors and countries.